Fudgy, dark chocolate cookie dough provides the perfect foundation for these white chocolate chip cookies. This week, Ben and I have been working on finding time to decompress and reconnect after what has turned out to be an incredibly busy spring for us. I’m thankful that we are finally starting to feel settled after moving into our new apartment. And I’m very much looking forward to the fact that we will both be home all weekend, since one or both of us has been out of town for four out of the last five. Speaking of travel, in the past month or so, these dark chocolate and white chocolate chip cookies have come with us to Wisconsin and even been flown across the country to Baltimore, then rural Pennsylvania! In other words, we’ve created good memories with these white chocolate chip cookies. Which, in a lot of ways, is what I think baking is all about. I love getting to share something sweet with people I love, for everything from the most special of occasions to the most ordinary of days. I hope you’ll create some good memories over these cookies, too. Please note that this page contains affiliate links. I will earn a small commission if you purchase through these links, at no extra cost to you. I only recommend tools and brands I know, use, and trust. Thank you for helping to support my blog! The cookie dough itself is made with dark cocoa powder and a dash of espresso powder. The espresso helps enhance the chocolate flavor and gives it a little more complexity, without adding a noticeable coffee taste. I like using dark cocoa powder because of its richness and the visually striking contrast it provides against the white chocolate chips. And P.S., if you’re a big fan of dark chocolate cookie dough, I guarantee you’ll love these Salted Caramel and Dark Chocolate Thumbprint Cookies as well! I always recommend lining your cookie sheet with a silicone baking mat . This was a game-changing tool for me when I started becoming more serious about my baking. I love how evenly the cookies bake on these mats, and they also help prevent excess spreading. Use a cookie scoop to portion out each ball of cookie dough so they are all the same size. I bake my cookies relatively large, using 3 tablespoons of dough per cookie. Chill your cookie dough! I know, it’s annoying when you just want cookies, NOW! But it really does make a difference in the flavor and texture of your cookies. If you want to prevent excess spreading and have thick, chewy cookies, don’t skip this step. Watch the cookies carefully as they bake – they are done when they are browned/set on the edges, but still slightly underbaked on top. They will continue to bake and set as they cool on the pan when you bring them out of the oven. If you make these dark chocolate and white chocolate chip cookies, don’t forget to take a photo and tag @flourcoveredapron on Instagram! 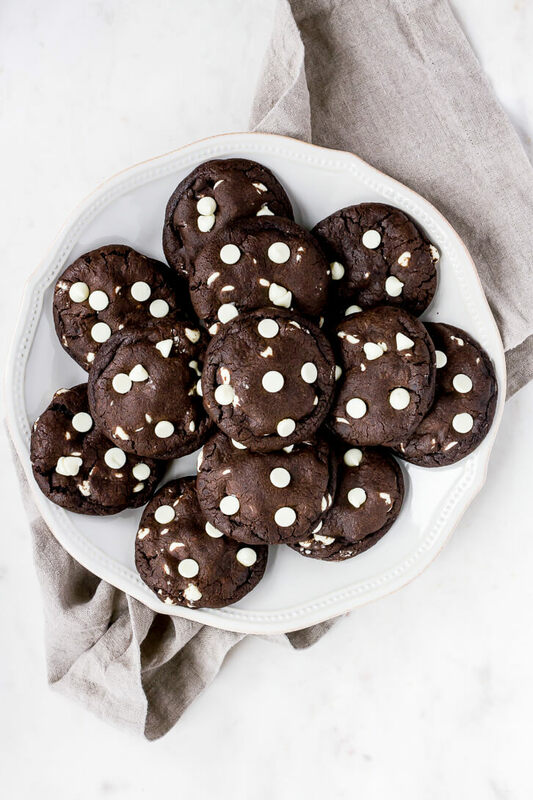 Fudgy, dark chocolate cookie dough provides a decadent and visually striking foundation in this recipe for white chocolate chip cookies. In a medium-size bowl, whisk together the flour, cocoa powder, espresso powder, baking soda, and salt. In a large bowl, using an electric mixer, beat butter and both sugars together until light and fluffy. With the mixer on low, add the vanilla, then the eggs one at a time. Beat until combined. Then, gradually add the flour mixture, mixing until just incorporated after each addition. Using a wooden spoon or rubber spatula, fold in the chocolate chips. Cover the bowl and chill the dough for 2 hours, or up to 3 days. Once dough is chilled, preheat the oven to 375 degrees Fahrenheit and line cookie sheets with silicone baking mats. Using a cookie scoop, measure out 3 tablespoons of dough at a time and roll into a ball. Place at least 2 inches apart on the prepared cookie sheets. Bake at 375 degrees for 9-11 minutes, one batch at a time. Cookies should still look slightly underbaked on top. They will continue to bake and set after being removed from the oven. Immediately press a few extra white chocolate chips on top of each cookie, as desired. Let cookies cool on the baking sheet for at least 5 minutes, then transfer to a wire rack to cool completely. Once cooled, store in an airtight container at room temperature.